While this is a great piece of computational propaganda, it sadly doesn’t describe any of the processes that it employs. (For that we’ll have to look at the video posted earlier.) And upon further exploration turns out that they are all designed by Vannevar Bush a pioneer of analog computing. His engines (seen in the above video) while painstaking to setup could solve complex equations quickly. Among his many inventions (microfiche being the longest lasting) he also invented the proximity fuze for use in artillery shells during WWII. A state of the art battery was to used to power a micro analog computer with miniaturized glass vacuum tubes, designed to survive 20,000 Gs of force/500 rotations a second and being fired from artillery cannon. This scientific wonder blasted a continuous pulse of radar to detect objects and could then compute the distance using it’s onboard analog brains. It was primarily used in blasting German V1 and V2 rockets out of the air, but as the war dragged on it found uses in almost all aspects of the war. 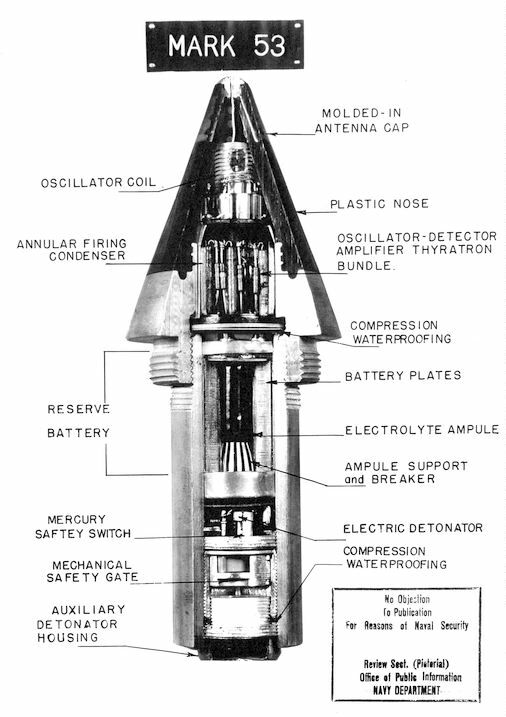 The proximity fuse was so popular that at the height of the war 40,000 were rolling off assembly lines every day. …the magnitude and complexity of the effort rank it among the three or four most extraordinary scientific achievements of the war. Vannevar was also a key player in starting the Manhattan project, and it was using he who set up the mechanical computers which led to the breakthrough. Oppenheimer’s calculations, which Bush had George Kistiakowsky check, estimated that the critical mass of a sphere of uranium-235 was in the range of 2.5 to 5 kilograms, with a destructive power of around 2,000 tons of TNT. This entry was posted in Analog Computing, Horology, Machining, Uncategorized and tagged history. Bookmark the permalink.